Manufacturer of a wide range of products which include water purification system and 2000 lph mineral water plant. 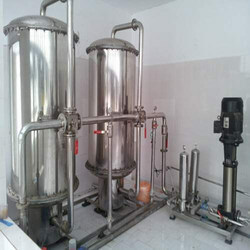 We are leading manufacturer and exporter of Water Purification System. Allpack Engineers is Offering you a complete choice of products which include Mineral Water Plants such as 2000 LPH Mineral Water Plant, Industrial Mineral Water Plant, Drinking Water Plant, Reverse Osmosis Plant, Institutional Water Plant, Packaged Drinking Water Plant and many more items.